Aristotle said “Give me a child until he is seven and I will show you the man.” Childhood lasts a little longer now than it did in the 4th century BCE and it’s available to girls now as well, but the principle remains the same: the experiences children have early in life have a profound effect on the adults they will become. At Meany Center, we believe that arts education should begin young and last a lifetime. That’s why we focus so much of our outreach efforts on K-12 students—and particularly those under-served kids who might not get the opportunity to experience live performance otherwise. 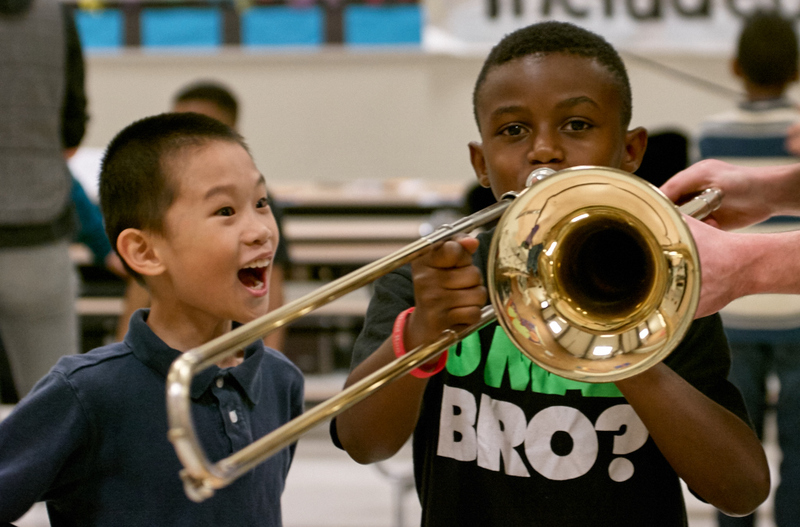 Students at Lowell Elementary explore the instrument petting zoo. Last season, we brought American roots singer/songwriter Martha Redbone to Seattle for a week-long residency in several public schools with high enrollments of African- and Native-American children (Redbone is of African American and Cherokee heritage). There was no public, ticketed performance to off-set the cost of the residency, and we were only able to bring her because of the generosity of our donors. Last season we also offered four free student matinees, each averaging about 1,000 students, featuring three dance companies (Grupo Corpo, MalPaso Dance Company and Martha Graham Dance Company), and one with the rock’em sock’em SO Percussion ensemble that had the kids stomping in the aisles. And we took the Daedalus Quartet and performers from the GlobalFest: Creole Carnival tour into local elementary schools for performances and Q&A with kids from kindergarten to fifth grade. This season we’ll again be offering several in-school residencies—with the dynamic and youthful Heath Quartet; Step Afrika!, one of the top African-American dance companies in America; and the ever-popular Pilobolus. We’ll also present three free matinees featuring the African-American wind quintet Imani Winds; the French-Algerian dance company, La Compagnie Hervé Koubi; and Step Afrika! Altogether we will touch the lives of as many as 5,000 young people this year. With your generous support, we are introducing children from seven to seventeen to the power, the beauty and the boundless joy of live performance. We hope the seeds we plant here will continue to grow for years to come. For more information about K-12 programs, contact Elizabeth Duffell at eduffell@uw.edu.